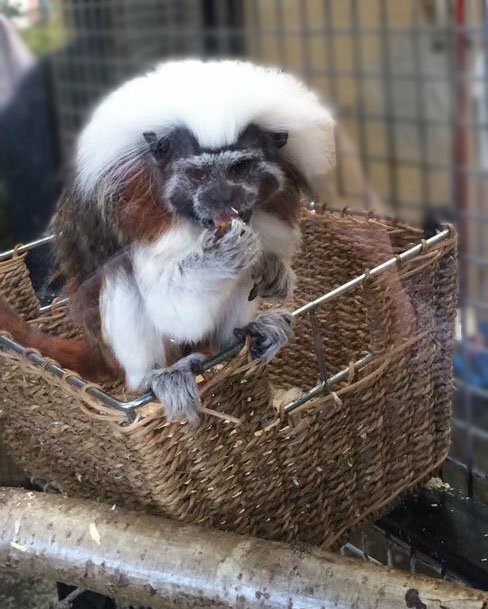 Uncas, the cotton-top tamarin, and his mate, Alice were confiscated from the UK pet trade as they did not have any licences to confirm they were captive bred. Uncas arrived at Monkey World on 26/02/09 and was in poor condition with a lack of muscle tone, limp fur, and dental problems. Alice was put to sleep at the end of 2012 as she was very elderly and had become immobile. Uncas spent a couple of years living with other small primates until Hawkeye arrived at the park on 12/02/15.